The Chrome Web Store is Google's online store for web applications for Google Chrome or Google Apps. It was announced at the Google I/O conference on May 19, 2010 by Vic Gundotra and released on December 6, 2010. The software allows users to install and run web applications for the Google Chrome browser. The Chrome Web Store user experience and design was created by Fi. The store hosts free and paid applications. An example of applications available in the store includes the game Plants vs. Zombies. The Store has been described as being like Google Play, but for "apps on the web". A visual and UI overhaul of the store was announced on October 25, 2011. Some commentators have questioned the need for an online app store, indicating that what is installed within the system ought to be freely available rather than give the illusion it has been "imported" from somewhere. Ryan Paul of Ars Technica said on December 9, 2010: "The way that users consume applications in the desktop and mobile world is fundamentally different than the way that they do it on the Web—where paywalls are often reviled and there is little distinction between content and software. In such an environment, does the application store model make any sense? We are not convinced...Aside from gaming, the idea of an application store in a Web browser—where installation is little more than bookmarking—seems counterintuitive and leaves us with the impression that the entire exercise is a solution in search of a problem." In January 2014, media outlets exposed a recent trend of developers selling the rights to their Chrome extensions to unknown third-party companies (for as much as "four-figure" amounts), who then silently push updates that incorporate previously non-existent adware into the extensions. The two extensions singled out by these reports, Tweet This Page and Add to Feedly, were pulled from Chrome Web Store by Google on January 19, 2014. Five percent of computer browser visits to Google owned websites are altered by computer programs that inject their own ads into pages. Researchers have identified 50,870 Google Chrome extensions and 34,407 programs that injected ads. Thirty-eight percent of extensions and 17 percent of programs were catalogued as malware, the rest being potentially unwanted adware-type applications. TechCrunch reported that sales of paid web apps had by January 2011 sunk, with the best-selling app earning just $165 a week. In December 2011, TechCrunch reported that the redesign of the Web Store had been a "boon for developers", with the remake seeming to "catalyze a big increase in traffic, across downloads, users, and total number of apps". As of June 2012, users had installed 750 million apps from the Chrome Web Store. ↑ Saint, Nick (2010-05-19). "Google Launching "Chrome Web Store"". Business Insider. Retrieved 2010-06-02. ↑ Kay, Erik (2010-05-19). "The Chrome Web Store". Google. Retrieved 2010-06-02. ↑ "The Chrome Web Store Case Study". We are Fi. Retrieved 2013-01-20. ↑ Rogers, Chris (2011-08-11). "Google Chrome Blog: Building better web apps with a new Chrome Beta". Chrome.blogspot.com. Retrieved 2013-06-14. ↑ "Publishing to the Chrome Web Store". Google Developers. Retrieved 2014-01-20. ↑ Siegler, MG (2010-05-19). "Google Previews Chrome Web Store — An App Store For The Web (If You're Using Chrome)". TechCrunch. Retrieved 2010-06-02. ↑ Miller, Ross (2010-05-19). "Google unveils Chrome web store, Sports Illustrated app impresses". Engadget. Retrieved 2010-06-02. ↑ Dybwad, Barb (2010-05-19). 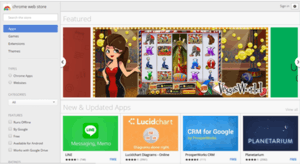 "Google Chrome Web Store to Create a Marketplace for Web Apps". Mashable. Retrieved 2010-06-02. ↑ Guymon, Shannon. "Making Chrome even more app-ealing". Retrieved 31 October 2011. ↑ Paul, Ryan. "Chrome Web Store: a solution in search of a problem?". Ars Technica. Retrieved 9 May 2011. ↑ "Adware vendors buy Chrome Extensions to send ad- and malware-filled updates". Ars Technica. Retrieved 20 January 2014. ↑ "Google Removes Two Chrome Extensions Amid Ad Uproar". Wall Street Journal. Retrieved 20 January 2014. ↑ "Ad Injection at Scale: Assessing Deceptive Advertisement Modifications" (PDF). ↑ Kincaid, Jason. "Sales Are At A Trickle On Google's Chrome Web Store". TechCrunch. Retrieved 4 January 2011. ↑ Empson, Rip. "New Chrome Web Store Proves To Be A Boon For Developers Above (And Below) The Fold". TechCrunch. Retrieved 5 December 2011. ↑ Vikas SN (2012-06-29). "The Lowdown: Google I/O 2012 Day 2 – 310M Chrome Users, 425M Gmail & More". MediaNama. Retrieved 2013-06-14.